Name Variation Theodore John Vosberg was also known as Teddy. Theodore John Vosberg was born on 7 February 1870 at Wisconsin. He married Margaret Klaus, daughter of Joseph Klaus and Dorethea Theresa Kieler, on 28 February 1896. Theodore John Vosberg died on 5 February 1941 at Illinois at age 70 Theodore Vosberg obituary. He was buried after 5 February 1941 at St. Mary's and St. James' Cemetery, Rockford, Winnebago, Illinois. [S250] U.S. Federal Census 1930 U.S. Federal Census, by Ancestry.com, Year: 1930; Census Place: Jamestown, Grant, Wisconsin; Roll: 2574; Page: 10A; Enumeration District: 22; Image: 351.0; FHL microfilm: 2342308. Name Variation Margaret E. Hoefer was also known as Margarite. Name Variation Margaret E. Hoefer was also known as Heffer. Name Variation Margaret E. Hoefer was also known as Maggie. Married Name 2 September 1884 As of 2 September 1884,her married name was Richard. Margaret E. Hoefer was born on 21 May 1861 at New Vienna, Dubuque, Iowa, also reported as Mar 1861. She was the daughter of Adam Hoefer and Barbara Queinbach. Margaret E. Hoefer married Henry J. Richard, son of Joseph Richard and Dorethea Theresa Kieler, on 2 September 1884 at Breela, Carroll, Iowa. Margaret E. Hoefer died on 21 October 1954 at at home, Dubuque, Dubuque, Iowa, at age 93 Margaret (Hoefer) Richard obituary. She was buried after 21 October 1954 at Mount Calvary Cemetery, Dubuque, Dubuque, Iowa. 1885 Dubuque, Dubuque, Iowa Margaret E. Hoefer appeared on the census of 1885 in the household of Henry J. Richard at Dubuque, Dubuque, Iowa. Margaret E. Hoefer had 6 with 6 living in 1900 children. [S245] U.S. Federal Census 1900 U.S. Federal Census, by Ancestry.com, Year: 1900; Census Place: Julien, Dubuque, Iowa; Roll: 430; Page: 8B; Enumeration District: 0106; FHL microfilm: 1240430. [S244] U.S. Federal Census 1910 U.S. Federal Census, by Ancestry.com, Year: 1910; Census Place: Dubuque Ward 3, Dubuque, Iowa; Roll: T624_401; Page: 5A; Enumeration District: 0124; ; FHL microfilm: 1374414. [S243] U.S. Federal Census 1920 U.S. Federal Census, by Ancestry.com, Year: 1920; Census Place: Dubuque Ward 3, Dubuque, Iowa; Roll: T625_488; Page: 11A; Enumeration District: 134; Image: 347. 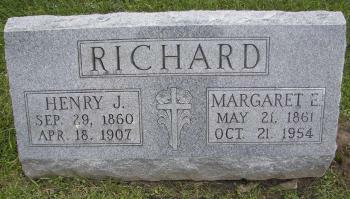 Reverand John H. Richard was born on 19 August 1885 at Iowa. He was the son of Henry J. Richard and Margaret E. Hoefer. 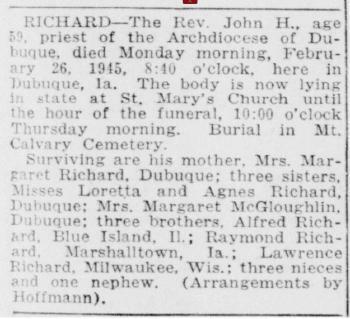 Reverand John H. Richard died on 26 February 1945 at Dubuque, Iowa, at age 59 Rev John H Richard, 59, obituary. He was buried after 26 February 1945 at Mount Calvary Cemetery, Dubuque, Dubuque, Iowa. Alfred F. Richard was born on 20 November 1887 at Iowa. Alfred F. Richard married Ida A. Meis, daughter of Fred Meis and Anna Hoefer, after 1947. Alfred F. Richard died on 5 May 1969 at age 81 Alfred F Richard, 81, obituary. He was buried after 5 May 1969 at Mount Calvary Cemetery, Dubuque, Dubuque, Iowa. Raymond P. Richard was born on 31 August 1891 at Dubuque, Iowa. Raymond P. Richard died on 7 February 1958 at VA hospital, Madison, Dane, Wisconsin, at age 66 Raymond P Richard, 66, obituary. He was buried after 7 February 1958 at Mount Calvary Cemetery, Dubuque, Dubuque, Iowa. Name Variation Margaret D. Richard was also known as Maggie. Married Name 20 October 1925 As of 20 October 1925,her married name was McGloughlin. Margaret D. Richard was born on 5 December 1893 at Iowa. She was the daughter of Henry J. Richard and Margaret E. Hoefer. 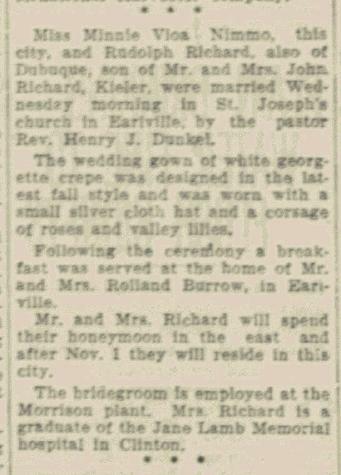 Margaret D. Richard married James F. McGloughlin on 20 October 1925 at Blessing, Iowa. Margaret D. Richard died on 18 June 1978 at age 84. She was buried after 18 June 1978 at Mount Olivet Cemetery, Key West, Dubuque, Iowa. Name Variation Lawrence B. Richard was also known as Larry. Lawrence B. Richard married Kathryn (?). Lawrence B. Richard was born on 14 May 1898 at Iowa. Lawrence B. Richard died on 18 December 1971 at Miami, Dade, Florida, at age 73 Lawrence B Richard, 73, obituary. He was buried after 18 December 1971 at Mount Calvary Cemetery, Dubuque, Dubuque, Iowa. Name Variation Loretta Richard was also known as Lauretta. Loretta Richard was born on 14 May 1898 at Iowa. As of 1925, Loretta Richard was never married. She died on 26 September 1992 at age 94. She was buried after 26 September 1992 at Mount Calvary Cemetery, Dubuque, Dubuque, Iowa, on tombstone with her sister Agnes. Agnes Richard was born on 21 October 1902 at Iowa. Agnes Richard died on 19 January 1992 at age 89. She was buried after 19 January 1992 at Mount Calvary Cemetery, Dubuque, Dubuque, Iowa, on tombstone with her sister Loretta. Name Variation Adam Hoefer was also known as Adron. Name Variation Adam Hoefer was also known as Heffer. Adam Hoefer was born at Germany. Name Variation Barbara Queinbach was also known as Zimbeck. Married Name Her married name was Heffer. Married Name Her married name was Hoefer. Barbara Queinbach married Adam Hoefer. Barbara Queinbach was born at Germany. Name Variation Dorothy Jansen was also known as Dorothea. Name Variation Dorothy Jansen was also known as Dora. Married Name circa 1876 As of circa 1876,her married name was Richard. Dorothy Jansen was born in 1859 at Wisconsin. She married John A. Richard, son of Joseph Richard and Dorethea Theresa Kieler, circa 1876. 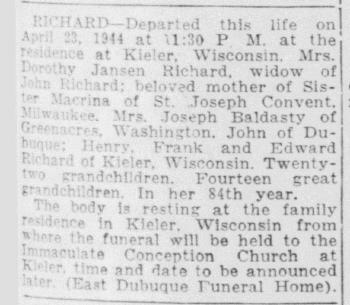 Dorothy Jansen died on 23 April 1944 at Kieler, Sauk, Wisconsin, Mrs. Dorothea Richard, 83, widow of John Richard, died at the family residence in Kieler, Wisconsin, Sunday evening, April 23, 1944, at 11:30 o'clock, after a lingering illness. The body rested at the family residence, and the funeral was held from the home to Immaculate Conception Church in Kieler, Wednesday morning, April 26, at 9 o'clock, with the Rev. A.J. Goetzman officiating. Father Goetzman delivered a sermon and also said the prayers at the graveside in Immaculate Conception Cemetery. Pallbearers were Arnold and Clarence Klaas, and Bert, Robert, Thomas, and Vernon Richard, all grandsons of the deceased. Members of the Mothers Sodality of the church attended in a body. Mrs. Richard was survived by six children, Sister Macrina, of St. Joseph's Convent, Milwaukee, Wis., Mrs. Joseph Baldasty, of Green Acres, Wash., John Richard, of Dubuque, Ia., and Henry Richard, Frank Richard, and Edward Richard, all of Kieler, Wis; 22 grandchildren and 14 great-grandchildren; and a number of nephews and nieces. Besides her husband, she was preceded in death by one daughter and two sons. She was buried after 23 April 1944 at Immaculate Conception Church Cemetery, Kieler, Grant, Wisconsin. 1905 Jamestown, Grant, Wisconsin Dorothy Jansen appeared on the census of 1905 in the household of John A. Richard at Jamestown, Grant, Wisconsin. Dorothy Jansen had 8 with 8 living in 1900 children. [S245] U.S. Federal Census 1900 U.S. Federal Census, by Ancestry.com, Year: 1900; Census Place: Jamestown, Grant, Wisconsin; Roll: 1790; Page: 1B; Enumeration District: 0037; FHL microfilm: 1241790. [S243] U.S. Federal Census 1920 U.S. Federal Census, by Ancestry.com, Year: 1920; Census Place: Jamestown, Grant, Wisconsin; Roll: T625_1988; Page: 8A; Enumeration District: 106; Image: 36. [S250] U.S. Federal Census 1930 U.S. Federal Census, by Ancestry.com, Year: 1930; Census Place: Jamestown, Grant, Wisconsin; Roll: 2574; Page: 1B; Enumeration District: 22; Image: 334.0; FHL microfilm: 2342308. [S373] U.S. Federal Census 1940 U.S. Federal Census, by Ancestry.com, Year: 1940; Census Place: Jamestown, Grant, Wisconsin; Roll: T627_4481; Page: 2A; Enumeration District: 22-22. Name Variation Dorothy Cordula Richard was also known as Dora C.
Married Name 28 February 1901 As of 28 February 1901,her married name was Klaas. Dorothy Cordula Richard was born on 15 January 1878 at Dickeyville, Grant, Wisconsin. She was the daughter of John A. Richard and Dorothy Jansen. Dorothy Cordula Richard married Joseph Maria Klaas, son of Johann Herman Klaas and Susanna Adelheid Wibben, on 28 February 1901. Dorothy Cordula Richard died on 28 February 1916 at Dubuque, Iowa, at age 38 Mrs. Dora C. Klaas, wife of Joseph M. Klaas, died Monday evening, February 28, 1916, at the family residence on Lincoln Avenue in Dubuque, Iowa, aged 38 years. Her death is mourned by her husband and four children, Catherine, Arnold, Clarence, and Herbert, also her parents, two sisters, and five brothers. 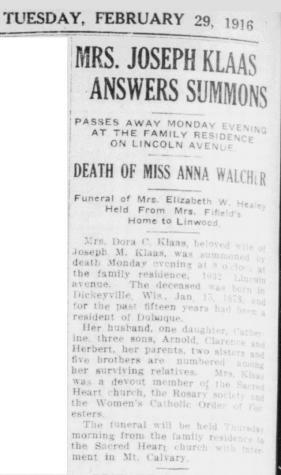 She was buried after 28 February 1916 at Mount Calvary Cemetery, Dubuque, Dubuque, Iowa. Name Variation Lucy Richard was also known as Sister Mary Macrina OSF. Lucy Richard was born on 1 December 1881 at Wisconsin. Lucy Richard died on 28 January 1973 at age 91. She was buried after 28 January 1973 at School Sisters of Saint Francis, Campbellsport, Fond du Lac, Wisconsin. 1905 Jamestown, Grant, Wisconsin Lucy Richard appeared on the census of 1905 in the household of John A. Richard at Jamestown, Grant, Wisconsin. Lucy entered St. Joseph Convent in Milwaukee on July 11, 1909; on August 10, 1910, she received her religious habit, and her religious name was Sister Mary Macrina. By 1957, Sister Macrina was retired to St. Joseph Convent in Campbellsport, Wisconsin. Sister Macrina Richard died on January 28, 1973. She was buried in the Sisters' Cemetery at Campbellsport, Wisconsin, in section C3, row 14, plot 7. John Lawrence Richard was born on 11 June 1884 at Kieler, Grant, Wisconsin. He was the son of John A. Richard and Dorothy Jansen. John Lawrence Richard married Caroline K. Wiederholt, daughter of Valentine Wiederholt and Sophia Schwerdt, on 26 September 1909. John Lawrence Richard died on 2 May 1947 at Iowa at age 62 John L. Richard, 62, of West Third Street in Dubuque, Iowa, died at 6 o'clock, Friday morning, May 2, 1947, in the family home. Although his health had been poor for several years, his death was unexpected. The body was removed to the Hoffman Mortuary in Dubuque, where friends called after 7 o'clock, Saturday evening, May 3. The funeral rites were held from the mortuary to the Church of the Nativity in Dubuque at 9 o'clock, Monday morning, May 5. The Rev. Francis P. Friedl, assistant pastor, conducted the services, also delivering the sermon, and officiating at burial in Mount Calvary Cemetery in Dubuque. Pallbearers were Fred Haas, Joseph Richard, Arnold Klaas, Luverne Wiederholt, Alfred Richard, and Ted Eddy, all relatives of the deceased. 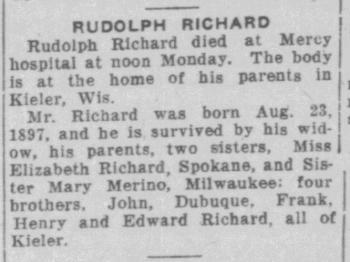 Mr. Richard was survived by his wife, Caroline; a daughter, Miss Vera Richard, of the home; two sons, Bert J. Richard, of Fort Atkinson, Ia., and Del J. Richard, of Creighton, Neb; six grandchildren; three brothers, Henry Richard, Frank Richard, and Edward Richard, all of Kieler, Wis; two sisters, Sister M. Macrina, St. Francis Order, of Milwaukee, Wis., and Mrs. Joseph Baldasty, of Spokane, Wash.
1905 Jamestown, Grant, Wisconsin John Lawrence Richard appeared on the census of 1905 in the household of John A. Richard at Jamestown, Grant, Wisconsin. Married Name Her married name was Baldasty. Elizabeth Barbara Richard married Joseph Baldasty. Elizabeth Barbara Richard was born on 1 December 1886 at Wisconsin also reported as Dec 1887. Elizabeth Barbara Richard died on 18 July 1973 at age 86. She was buried after 18 July 1973 at Holy Cross Cemetery, Spokane, Spokane, Washington. 1905 Jamestown, Grant, Wisconsin Elizabeth Barbara Richard appeared on the census of 1905 in the household of John A. Richard at Jamestown, Grant, Wisconsin. Name Variation Henry Joseph Richard was also known as Joseph Henry. Henry Joseph Richard was born on 22 March 1890 at Grant, Wisconsin. Henry Joseph Richard married Josephine Lange before 1923. Henry Joseph Richard died on 20 October 1964 at at home, Cuba City, Grant, Wisconsin, at age 74 Henry Joseph Richard, 74, obituary. 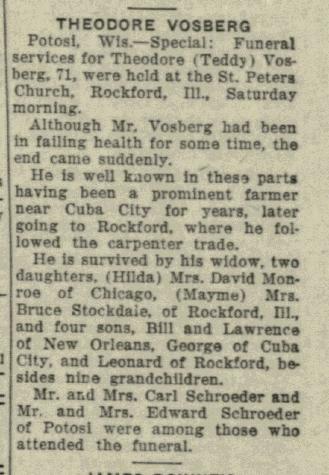 He was buried after 20 October 1964 at Saint Rose of Lima Cemetery, Cuba City, Grant, Wisconsin. 1905 Jamestown, Grant, Wisconsin Henry Joseph Richard appeared on the census of 1905 in the household of John A. Richard at Jamestown, Grant, Wisconsin. Name Variation Mathias L. Richard was also known as Matt. Mathias L. Richard was born on 30 June 1892 at Wisconsin also reported as May 1892. Mathias L. Richard died on 15 August 1912 at age 20 The Mississippi River claimed its third victim inside of twenty-four hours on Thursday afternoon, August 15, 1912, when Matt Richard, aged twenty-one years, of Kieler, Wisconsin, was drowned at the Old Rock House, an old structure a short distance above Sinope Creek. Richard, accompanied by two companions, went up that way early in the afternoon to go swimming. After a short time in the water, Richard stepped off a reef, which runs along the creek, and was, as far as his companions know, seized with cramps, and sank immediately. He was accompanied by two young men named Johnson and Cullen. The accident occurred about three o'clock, and the body was recovered about an hour later by fishermen and his companions, who dragged the river at the same point where he went down. The water at that place was a little over ten feet deep. The victim of the tragedy was the son of John Richard, a farmer at Kieler, Wisconsin, and was employed by his father on the farm. Richard with his two companions drover over from Kieler on Thursday to spend the day at Kimball's Park. The father of the young man telephoned down Thursday evening requesting that the body be brought there immediately. He was buried after 15 August 1912 at Immaculate Conception Church Cemetery, Kieler, Grant, Wisconsin. 1905 Jamestown, Grant, Wisconsin Mathias L. Richard appeared on the census of 1905 in the household of John A. Richard at Jamestown, Grant, Wisconsin. Frank Christ Richard was born on 29 May 1894 at Grant, Wisconsin, also reported as Feb 1894. Frank Christ Richard married Louise Helen Gunderman, daughter of Valentine Gunderman and unknown (? ), on 2 February 1918. Frank Christ Richard died on 16 May 1959 at Dubuque, Iowa, at age 64 Frank C. Richard, 64, of Kieler, Wisconsin, died Saturday, May 16, 1959, at Mercy Hospital in Dubuque, Iowa. Visitation was after 2 p.m., Sunday, May 17, at the Haudenshield Funeral Home in East Dubuque, Illinois, and the body was taken to the family residence at noon, Monday, May 18. Services were at 9:30 a.m., Tuesday, May 18, at the family residence in Kieler, with the Rev. Joseph M. Brickl, pastor of Immaculate Conception Church in Kieler, officiating. Burial was in the church cemetery in Kieler. 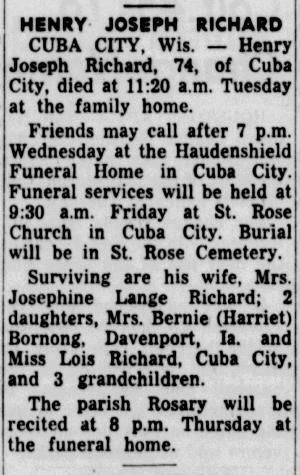 Mr. Richard was survived by his wife, Louise; a daughter, Mrs. Frank Platten, of Dubuque, Ia; a son, Vernon Richard, of Kieler, Wis; two grandchildren; two sisters, Sister M. Macrina, OSF, of Campbellsport, Wis., and Mrs. Joe Baldasty, of Spokane, Wash; and two brothers, Henry Richard, of rural Hazel Green, Wis., and Edward Richard, of Kieler, Wis. He was buried after 16 May 1959 at Immaculate Conception Church Cemetery, Kieler, Grant, Wisconsin. 1905 Jamestown, Grant, Wisconsin Frank Christ Richard appeared on the census of 1905 in the household of John A. Richard at Jamestown, Grant, Wisconsin. On 2 February 1936 at Kieler, Grant, Wisconsin, attended Frank and Louise (Gunderman) Richard 18th wedding anniversary celebration. Name Variation Rudolph Wilbert Richard was also known as Rudolph John. Rudolph Wilbert Richard was born on 23 August 1897 at Kieler, Grant, Wisconsin, also reported as May 1898. Rudolph Wilbert Richard married Minnie Viola Nimmo on 8 October 1930 at Earlville Minnie Viola Nimmo and Rudolph Richard marriage announcement. Rudolph Wilbert Richard died on 25 April 1932 at Dubuque, Iowa, at age 34 Rudolph Richard obituary. 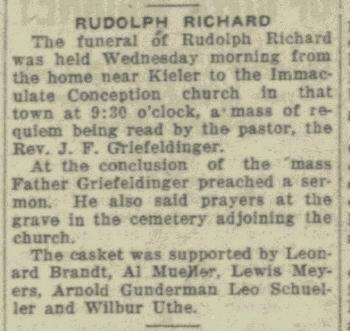 He was buried after 25 April 1932 at Immaculate Conception Church Cemetery, Kieler, Grant, Wisconsin, Rudolph Richard funeral. 1905 Jamestown, Grant, Wisconsin Rudolph Wilbert Richard appeared on the census of 1905 in the household of John A. Richard at Jamestown, Grant, Wisconsin. Name Variation Edward P. Richard was also known as Ed. Edward P. Richard was born on 24 July 1903 at Wisconsin. Edward P. Richard married Alice Christine Brandt, daughter of Louis Brandt and Victoria Wiederholt, on 22 November 1923 at Kieler, Grant, Wisconsin. Edward P. Richard died on 21 February 1985 at Dubuque, Iowa, at age 81 Edward P. Richard, 81, of Kieler, Wisconsin, died Thursday night, February 21, 1985, at St. Joseph's Unit, Mercy Health Center, in Dubuque, Iowa. Visitation was from 2 to 9 p.m., Sunday, February 24, at Gene Siegert and Son Funeral Home in Cuba City, Wisconsin, where the Rosary was said at 8 p.m. Funeral services were at 11 a.m., Monday, February 25, at Immaculate Conception Church in Kieler, and burial was in the church cemetery. 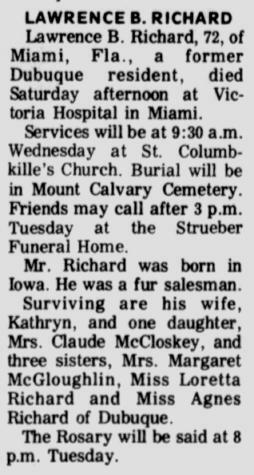 Mr. Richard was survived by five sons, Robert L. Richard, John V. Richard, and Larry M. Richard, all of Kieler, Wis., Thomas F. Richard, of Hazel Green, Wis., and James P. Richard, of Madison, Wis; four daughters, Mrs. Merlin (Dorothy Jane) Klaas, Mrs. Robert (Jeanette) Klaas, and Carol Sagers, all of Platteville, Wis., and Mrs. Merlyn (Violet) Kuhl, of Clinton, Ia; and 60 grandchildren and 50 great-grandchildren. He was buried after 21 February 1985 at Immaculate Conception Church Cemetery, Kieler, Grant, Wisconsin. 1905 Jamestown, Grant, Wisconsin Edward P. Richard appeared on the census of 1905 in the household of John A. Richard at Jamestown, Grant, Wisconsin. Name Variation Louise Helen Gunderman was also known as LuLu. Name Variation Louise Helen Gunderman was also known as Lula. Married Name 2 February 1918 As of 2 February 1918,her married name was Richard. Louise Helen Gunderman was born on 17 January 1896 at Kieler, Grant, Wisconsin. She was the daughter of Valentine Gunderman and unknown (?). Louise Helen Gunderman married Frank Christ Richard, son of John A. Richard and Dorothy Jansen, on 2 February 1918. Louise Helen Gunderman died on 2 April 1988 at Dubuque, Dubuque, Iowa, at age 92 Louise H. "LuLu" Richard, 92, of Dickeyville, Wisconsin, and formerly of Kieler, Wisconsin, died at 2 p.m., Saturday, April 2, 1988, at The Finley Hospital in Dubuque, Iowa. Visitation was until 9 p.m., Monday, April 4, at the Haudenshield Funeral Home in Cuba City, Wisconsin, where the parish Rosary was said at 8 p.m. Funeral services were at 10:30 a.m., Tuesday, April 5, at Immaculate Conception Church in Kieler, and burial was in the church cemetery. 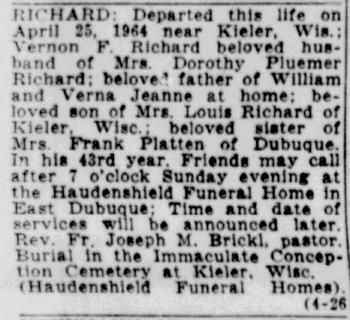 Mrs. Richard was survived by a daughter, Jenell Platten, of Hazel Green, Wis; two grandchildren, three great-grandchildren, and two great-great-stepgrandchildren; and a brother, Herbert Gunderman, of Dickeyville, Wis. She was preceded in death by her husband, Frank, on May 16, 1959, and a son, Vernon, on April 25, 1964. She was buried after 2 April 1988 at Immaculate Conception Church Cemetery, Kieler, Grant, Wisconsin. Married Name 25 June 1953 As of 25 June 1953,her married name was Platten. Jenell Dorothy Richard was born on 3 January 1919 at Wisconsin. She was the daughter of Frank Christ Richard and Louise Helen Gunderman. Jenell Dorothy Richard married Frank Alfred Platten on 25 June 1953. Jenell Dorothy Richard died on 9 August 2006 at Dubuque, Iowa, at age 87 Jenell D. Platten, 87, of Cuba City, died Wednesday, Aug. 9, 2006, at Mercy Medical Center-Dubuque. Vernon Francis Richard was born on 15 March 1921 at Wisconsin. He was the son of Frank Christ Richard and Louise Helen Gunderman. Vernon Francis Richard married Dorothy Marie Pluemer, daughter of Arnold F. Pluemer and Leona C. Muller, in June 1944 at Tennyson, Grant, Wisconsin, Dorothy Marie Pluemer and Vernon Francis Richard marriage announcement. Vernon Francis Richard died on 25 April 1964 at near Kieler, Grant, Wisconsin, at age 43 Vernon Francis Richard obituary. Frank Alfred Platten was born on 1 September 1916. He married Jenell Dorothy Richard, daughter of Frank Christ Richard and Louise Helen Gunderman, on 25 June 1953. Frank Alfred Platten died on 19 September 1978 at Grant, Wisconsin, at age 62. Married Name June 1944 As of June 1944,her married name was Richard. Dorothy Marie Pluemer was born on 20 November 1925 at Wisconsin. She was the daughter of Arnold F. Pluemer and Leona C. Muller. Dorothy Marie Pluemer married Vernon Francis Richard, son of Frank Christ Richard and Louise Helen Gunderman, in June 1944 at Tennyson, Grant, Wisconsin, Dorothy Marie Pluemer and Vernon Francis Richard marriage announcement. Married Name circa 1924 As of circa 1924,her married name was Pluemer. Leona C. Muller was born circa 1904 at Wisconsin. She was the daughter of August Muller and Kate (?). Leona C. Muller married Arnold F. Pluemer, son of Joseph F. Pluemer and Josephine M. Langmeier, circa 1924. 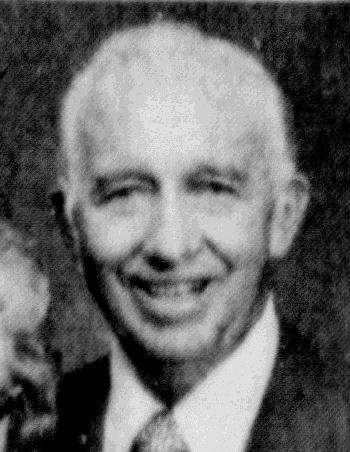 Donald A. Pluemer was born circa 1924 at Michigan. He was the son of Arnold F. Pluemer and Leona C. Muller. Name Variation Lloyd J. Pluemer was also known as Loyd J.
Lloyd J. Pluemer was born on 19 October 1926 at Wisconsin. Lloyd J. Pluemer married Mildred Clara Schiel, daughter of Frank Raphael Schiel and Clara D. Meoska, on 24 June 1950. Lloyd J. Pluemer died on 16 September 1990 at age 63. He was buried after 16 September 1990 at Mount Calvary Cemetery, Dubuque, Dubuque, Iowa. Married Name 8 June 1948 As of 8 June 1948,her married name was Fecht. Hazel E. Pluemer was born on 28 November 1928 at Wisconsin. 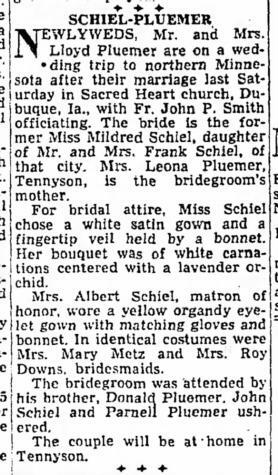 Hazel E. Pluemer was a bridesmaid at the wedding of Dorothy Marie Pluemer and Vernon Francis Richard in June 1944 at Tennyson, Grant, Wisconsin; Dorothy Marie Pluemer and Vernon Francis Richard marriage announcement. 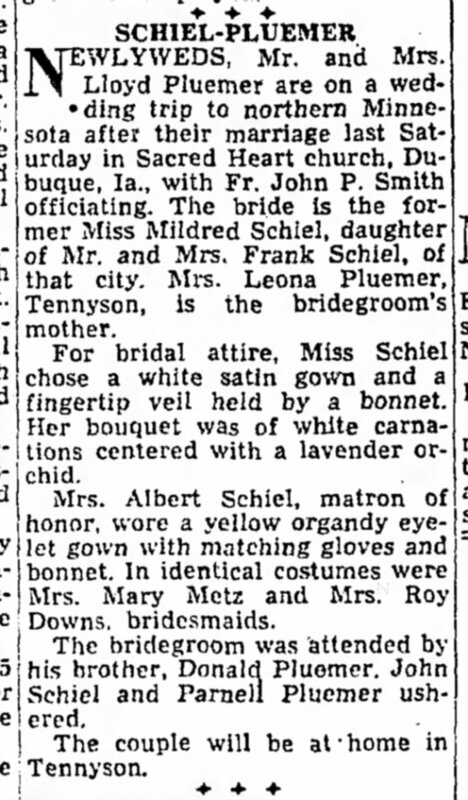 Hazel E. Pluemer married Francis J. Fecht, son of Joseph Herman Fecht and Anna Josephine Wunderlin, on 8 June 1948 at Tennyson, Grant, Wisconsin. Hazel E. Pluemer died on 19 September 2017 at age 88 Hazel E. Fecht, age 88, of Tennyson, passed away peacefully September 19, 2017 surrounded by her loving family. Hazel (Pluemer) Fecht was born on November 28, 1928 in Belmont, Wisconsin to Arnold and Leona (Muller) Pluemer and attended Saint Andrew Grade School and High School in Tennyson. Before marriage, Hazel worked at Dubuque Packing Company and J.F. Walsh’s Store, Tennyson. Hazel married Francis Fecht on June 8, 1948. Francis preceded her in death in 1992. Francis and Hazel lived their lives together in Tennyson, WI, and were faithful members of the community and faithfully participated in the parish life of SS Andrew and Thomas Parish. For many years, Hazel sang in the parish choir at Saint Andrew’s and for a period was president of the CCW, Director of the CCD program and taught religious education at SS Andrew and Thomas Parish. She was also a devoted member of the Catholic Knights for more than 60 years. Hazel was also preceded in death by her parents, her grandson, Elliott Fecht, her brothers Donald, Lloyd, Parnel, and Robert Pluemer. A Mass of Christian Burial will be held on Saturday, September 23, 2017 at 11:00 a.m. at Saint Andrew’s Catholic Church, Tennyson, with Rev. Geoffrey "Ron" Fecht, OSB, officiating and Father Richard Leffler concelebrating. Burial will be in Saint Andrew’s Cemetery, Tennyson. Friends may call from 9:00 a.m. until time of services at the church. The Martin Schwartz Funeral Home & Crematory, Potosi, is in charge of arrangements.